The Trumpet was made by Wolff Birckholtz, who was a “Trompetenbaumeister” in Nürnberg. There are no records that document the exact year of his birth or where he was born. He received his training from Hans Hainlein, also a master instrument maker in Nürnberg, and was released from his apprenticeship with the title of “Meister“ in the year 1649. 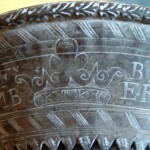 His maker’s mark is a crown, which harkens back to his connection as workshop successor to the the Schnitzer family, also famous Nürnberg trumpet makers. Evidence shows that his activities as a maker began in 1650. The Belitz trumpet and a trombone in the Leipzig collection both date from this time. His surviving instruments speak very highly for the level of his experience and artistry. The high level of his work, much more than the scant documentation about his life, places him among the ranks of the most important Nürnberg trumpet makers of his time. He and his wife both died in June of 1701. According to the available information, his workshop was not taken over or continued after his death. One of the very fortunate surpises related to the discovery of this trumpet is the fact that the name of its original owner is known. 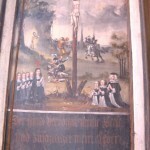 In the painting on the the memorial plaque, Jacob Hintze and and his Family, along with scenes from his life, are depicted. Some information about his life, though incomplete and sketchy, is to be found in the old church record books, leaving plenty of room for fantasy and speculation about the details of his life. From these records it can be established that Jacob Hintze was born in 1624, and held the title of “Stabstrompeters“. In the military, the stabstrompeter’s duty was to communicate through trumpet signals orders in battle such as “charge“ or“ retreat“. Hintze was the owner and proprietor of the tavern “Neuen Kruges“ in Neu Heinde, which was the last stoping off place for horse drawn commercial traffic on its way to the harbor city of Rostock. In the middle of the 17th century mail service was introduced in Mecklenburg. 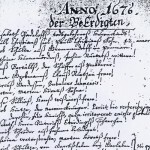 Beginning in 1644 the mail between Schwerien and Rostock became quite reliable, and the “Neuen Kruges“ was a post office on an important postal route. Obviously only a reliable man of some accomplishment could be entrusted with this post office, and granted the income from it. This source of income was granted to Hinze out of the estate of the Duke. Jacob Hinze and his wife Elisabeth Bauchen were citizens of high standing, and each had a family coat of arms which appears on the memorial plaque. They had four sons and two daughters, and the family had an unusually large circle of friends. Hintze died a violent death in 1676 at the age of 52. Insults, a scuffle, and weapons are mentioned as having been involved. The man responsible for his death was Joachim Wadegahte. For his burial on June 9th, 1676 in the church in Belitz his widow paid the princely sum of 20 Reichstalers, and in 1677 donated the memorial plaque with his trumpet and sword (the sword disappeared sometime after 1970). What was the source of this large sum of money? In this same year she married the wealthy notary Christophorus Schleef of Rostock….. During later renovations of the church, the grave was removed. Inscription on the Memorial plaque: „Der Feind verfolget meine Seele und zerschlägt mein Leben zu Boden.